To compare the accuracy of different intraocular lens (IOL) calculation formulas available on the American Society of Cataract and Refractive Surgery (ASCRS) post-refractive surgery IOL power calculator for the prediction of multifocal IOL power after previous corneal refractive laser surgery for myopia. 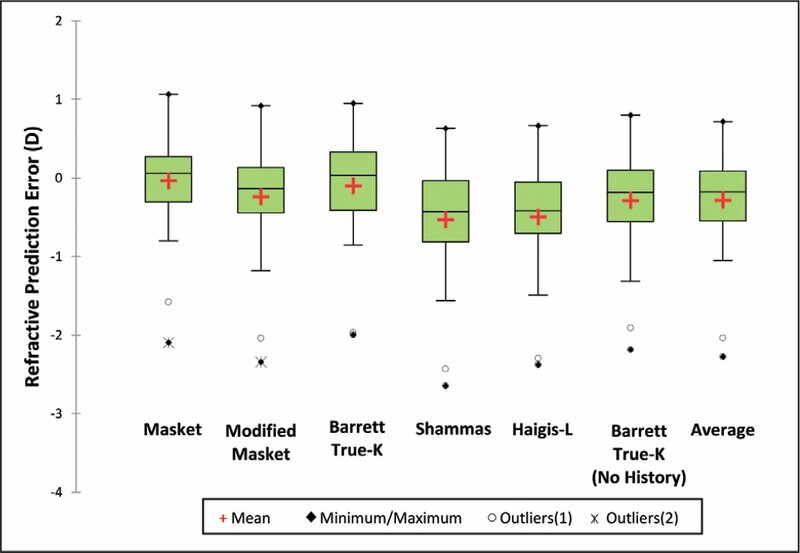 An analysis and comparison were performed of the accuracy of three methods using surgically induced change in refraction (ie, Masket, Modified Masket, and Barrett True-K formulas) and three methods using no previous data (ie, Shammas, Haigis-L, and Barrett True-K No History formulas). The average of all formulas was also analyzed and compared. Thirty-six eyes of 36 patients were included. All formulas, except for the Masket, Modified Masket, and Barrett True-K formulas, had myopic mean numerical errors that were significantly different from zero (P ⩽ .01). The median absolute error of the Shammas formula (0.52 diopters [D]) was significantly higher compared to all of the other formulas (P < .05), except for the Haigis-L formula (P = .09). Comparing the formulas using no previous data, the Barrett True-K No History formula had the lowest median absolute error (0.33 D, P < .001). The Shammas formula showed the least accuracy in predicting IOL power in eyes with multifocal IOL implantation after previous corneal refractive laser surgery for myopia. In eyes with all available data, all formulas performed equally except for the Shammas formula, whereas in eyes lacking historical data, the Barrett True-K No History formula performed best. Many patients worldwide have undergone corneal refractive laser surgery and will develop cataracts or presbyopia. It is known that these patients will have high expectations of maintaining or regaining spectacle independence after cataract surgery. However, the calculation of intraocular lens (IOL) power after refractive laser surgery is challenging, mainly due to incorrect estimation of the corneal power and effective lens position.1–4 Numerous formulas are available to calculate the IOL power, but choosing the appropriate formula can be difficult and time consuming. To facilitate this process, the American Society of Cataract and Refractive Surgery (ASCRS) developed the post-refractive surgery IOL power calculator ( www.iolcalc.org). Surgeons can enter refractive and keratometry data in the free online calculator and it automatically generates various IOL power predictions, helping the surgeon to select the appropriate IOL for these specific patients. Recently, newer formulas have been added to the calculator, such as the Barrett True-K formula,5 but few studies have been conducted about their performance.6,7 Currently, the ASCRS online calculator is the application of choice of many surgeons in managing these complicated cases. To the best of our knowledge, no previous studies have been conducted about multifocal IOL calculation in this specific patient group. 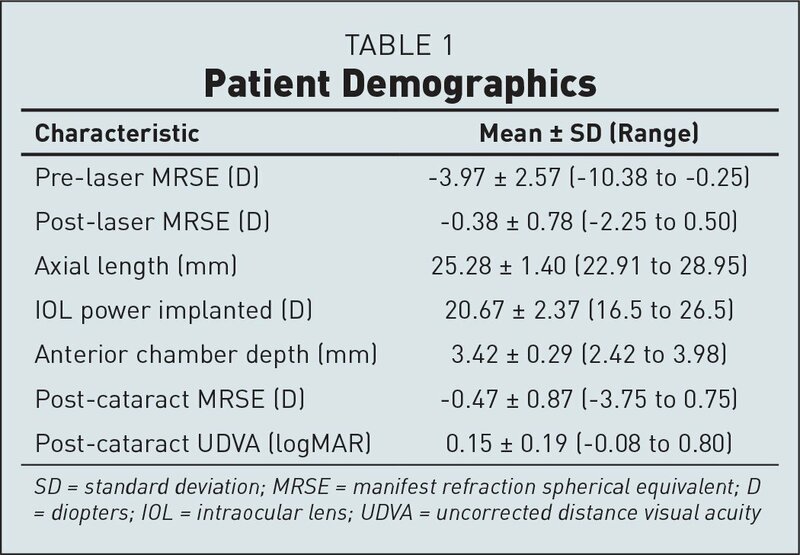 The purpose of this study was to compare the accuracy of different IOL calculation formulas available on the ASCRS post-refractive surgery IOL power calculator for the prediction of multifocal IOL power after previous corneal refractive laser surgery for myopia. Case records of patients with previous myopic corneal laser surgery (laser in situ keratomileusis [LASIK], laser epithelial keratomileusis [LASEK], and photorefractive keratectomy [PRK]) who had had multifocal IOL implantation with a ReSTOR SN6AD1 (Alcon Laboratories, Inc., Fort Worth, TX) between March 2008 and March 2015 in the Retina Total Eye Care clinic were reviewed retrospectively. The study adhered to the te-nets of the Declaration of Helsinki. The Medical Ethics Committee of the Academic Medical Center of Amsterdam exempted the study from official review due to its retrospective and theoretical nature, and the fact that all patients had signed an informed consent preoperatively to have their data used for scientific analysis. Inclusion criteria were uncomplicated phacoemulsification for cataract or presbyopia with complete refractive data before and at least 6 months after the previous laser surgery. Surgery was done by one of two surgeons (IJEV or RL-G) with the Infinity Ozil phaco unit (Alcon Laboratories, Inc.), through a 2.2-mm near-clear corneal incision on a 100° axis, under local anesthesia. Keratometry had been measured with an Orbscan (Bausch & Lomb, Rochester, NY) before the previous laser treatment. Biometry was performed with the IOLMaster (software versions 2 and 5.1; Carl Zeiss Meditec AG, Jena, Germany). IOL calculations were done with the ASCRS post-refractive surgery IOL power calculator and the appropriate IOL power was chosen according to each surgeon's judgment. In a cohort of 36 patients with 64 eyes with complete data sets, one eye per patient, was included by randomization (Research Randomizer 4.08) for statistical reasons. The accuracy of the Masket formula,9 Modified Masket formula,10 Barrett True-K formula,5,11 Shammas with regression analysis,12 Haigis-L formula,13 Barrett True-K No History formula,5,11 and the average value of all formulas were analyzed. The formulas were followed according to the order of their appearance in the ASCRS calculator. Other formulas available on the ASCRS calculator were not included in the analysis because we did not have access to the measuring devices required for these methods. The refractive prediction error was calculated as the difference between the actual postoperative refractive outcome and the predicted refraction for the implanted IOL calculated by the ASCRS online calculator for each formula or method. The surgeons' standard routine IOL constants for the ReSTOR SN6AD1 were used for the ASCRS online calculator (A-constant = 119.0; SF = 1.79; a0 = −0.523, a1 = 0.172, a2 = 0.211). The mean numerical error, median absolute error, mean absolute error, and percentages of eyes with a refractive prediction error within ±0.50 and ±1.00 diopters (D) were calculated for each formula or method. The one-sample signed-rank test was used to determine whether the mean numerical errors produced by the various formulas were significantly different from zero. The variances in the mean numerical errors were analyzed using Levene's test to evaluate the consistency of the predictions' performance. The absolute errors were compared using the Wilcoxon signed-rank test. The percentages of eyes within ±0.50 and ±1.00 D were compared using McNemar's test. Statistical analysis was done with XLSTAT (version 2014.2.03; Addinsoft, New York, NY) and SPSS for Windows (version 22.0; SPSS, Inc., Chicago, IL) software. A P value of less than .05 was considered to be statistically significant. After randomization, this study included 36 eyes of 36 patients from a cohort of 64 eyes. Table 1 shows the patient demographics. The mean manifest refraction spherical equivalent after cataract extraction was −0.47 D. The mean uncorrected distance visual acuity was 20/30 (0.15 logMAR). Figure 1 presents the box plots of the refractive prediction error of the different formulas. The mean numerical errors ranged from −0.04 to −0.53 D. All formulas, except for the Masket (P = .912), Modified Masket (P = .055), and Barrett True-K (P = .671), had a mean numerical error that was significantly different from zero (P ≤ .01). However, the Modified Masket had a borderline P value of .055, which is actually an equivocal result. The median absolute errors ranged from 0.28 to 0.52 D. The median absolute error of the Shammas formula (0.52 D) was significantly higher compared to all other formulas (P < .05), except for the Haigis-L formula (P = .09). The median absolute error of the Haigis-L formula (0.45 D) was significantly higher compared to the Modified Masket, Barrett True-K No History, and average (P < .05). The median absolute errors of the two Barrett True-K formulas were comparable (P = .844) (Table 2). The variance of the different formulas ranged from 0.36 to 0.47 D2. There were no statistically significant differences between them (P = .993) (Table 3). 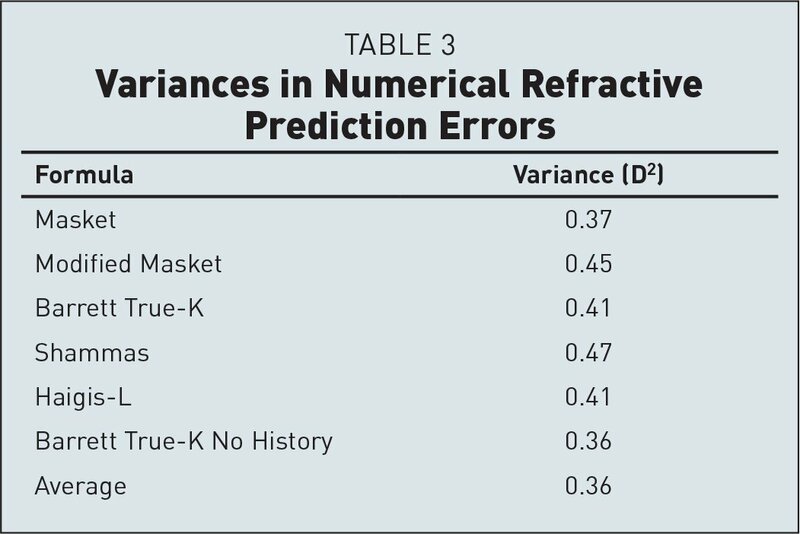 Figure 2 shows the refractive accuracy in terms of the percentage of eyes with a refractive prediction error within ±0.50 and ±1.00 D. For the percentage of eyes within ±1.00 D, there were no significant differences between the formulas. For eyes with a refractive prediction error within ±0.50 D, the Shammas formula showed the lowest percentage (50.0%). This was not statistically significantly lower than all other formulas, with the exception of the difference between the Shammas and the Barrett True-K No History (P = .016). The Barrett True-K and the Barrett True-K No History formulas both showed 69.4% of eyes within ±0.50 D.
Of the various formulas that do not use historical data (Shammas, Haigis-L, and Barrett True-K No History), the Barrett True-K No History formula showed a statistically significant lower median absolute error (P < .001) and a higher percentage of eyes within ±0.50 D (69.4%) compared with the Shammas (50.0%) (P = .016) and Haigis-L (55.6%) (P = .063) formulas. 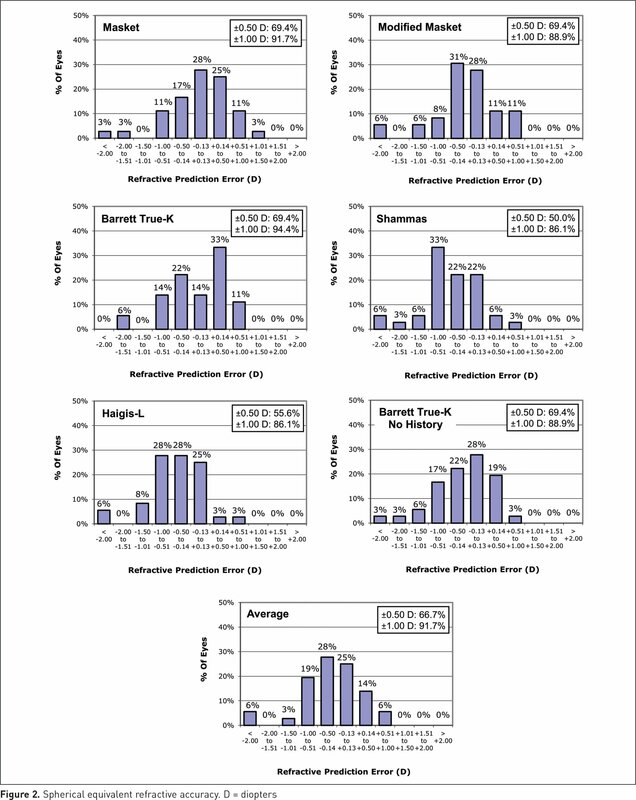 Several reports have been published about the performance of the ASCRS calculator, all of which use data from monofocal IOLs.6,7,14,15 Although multifocal IOL implantation after previous corneal refractive laser surgery is controversial because of the assumption that the laser surgery alters the cornea in such a manner that implanting a multifocal IOL could cause vision to deteriorate, several studies have shown good results in visual acuity and refractive outcome in these patients.16–18 Patients with previous corneal refractive surgery are known to be demanding, and surgeons might consider offering them a multifocal IOL to attain a higher degree of spectacle independence. The purpose of this study was to compare the accuracy of the different calculation formulas available on the ASCRS post-refractive surgery IOL power calculator for the prediction of multifocal IOL power after previous corneal refractive laser surgery for myopia. An emmetropic outcome is important in achieving optimal visual functioning, especially in multifocal IOL implantation. All formulas, except for the Masket, Modified Masket, and Barrett True-K, showed a statistically significant negative mean numerical error; these results suggest that minor adjustment of the IOL constants of those formulas are needed for our center. In cases with residual refractive error, a laser enhancement treatment was considered. When comparing our results to the literature, we found a slightly higher percentage of eyes within ±0.50 D and a comparable percentage of eyes within ±1.00 D for the Barrett True-K formula in relation to the percentages published by Abulafia et al.6 In comparison to the study by Wang et al.7, we found a slightly better performance. For the Masket formula, we seemed to have better6,7,14,24,25 or comparable26 outcomes. For the percentage of eyes within ±1.00 D, we had better6,24,25 or comparable7,14 outcomes. The outcome of the Modified Masket formula was (slightly) better6,7,25 or comparable14 for the percentages of eyes within ±0.50 and ±1.00 D.
Of the formulas that do not use historical data, the Barrett True-K No History performed best, with the lowest median absolute error (0.33 D, P < .001) and the highest percentage of eyes within ±0.50 D (69.4%). This percentage was statistically significantly higher than the Shammas formula (P = .016), but not statistically significant compared with the Haigis-L formula (P = .063). To our knowledge, this is the first report comparing the Barrett True-K and Barrett True-K No History formulas. We found equal performance, with 69.4% of eyes within ±0.50 D and median absolute errors of 0.37 and 0.33 D, respectively. One limitation of our study is the relatively small sample size. However, our cohort is the largest published in the literature until now. The second limitation is that we found negative mean numerical errors and did not adjust them to zero by optimizing the IOL constants. Also, the results showed no significant difference in variances. This makes it hard to do a precise comparison of the accuracy of the various formulas. However, not all surgeons have optimized IOL constants available for this specific patient group, and we believe our results represent real-life practice. Another limitation of this study is that only a selected number of formulas were evaluated because we did not have access to the measuring devices needed for the other formulas. Further studies are needed to assess those formulas and compare them to the other ones. Finally, we did not analyze subgroups for eyes with different keratometry values and axial lengths. This study shows that for eyes with previous corneal refractive laser surgery for myopia, based on our database and using our optimized IOL constants for normal eyes, the various tested formulas available on the ASCRS online calculator performed equally, except for the Shammas formula, which was significantly less accurate. When no refractive history was available, the Barrett True-K No History formula performed best. Further studies are needed to evaluate these formulas for eyes with previous hyperopic laser surgery. Barrett GD. “True-K Formula” presented at the World Ophthalmology Congress, Hong Kong, June2008. Discussed in Eye-World Meeting Reporter, under “Advanced phaco techniques.” August 2008. http://www.eyeworld.org/article.php?sid=4580. Urbaniak GC, Plous S. Research Randomizer (Version 4.0) [computer software]. http://www.randomizer.org. Accessed June 22, 2013. Hill WE. IOL power calculations following keratorefractive surgery. Presented at the ASCRS Symposium on Cataract, IOL and Refractive Surgery. ; March 2006. ; San Francisco, CA. .
Huang D, Tang M, Wang L, et al. Optical coherence tomography-based corneal power measurement and intraocular lens power calculation following laser vision correction (an American Ophthalmological Society thesis). Trans Am Ophthalmol Soc. 2013;111:34–45. From the Department of Ophthalmology, Amsterdam University Medical Center, University of Amsterdam, Amsterdam, the Netherlands (VV, IJEV, MPM, RL-G); the Department of Ophthalmology, Shaare Zedek Medical Centre, Jerusalem, Israel (AA); the Department of Ophthalmology, Hebrew University of Jerusalem, Jerusalem, Israel (AA); and Retina Total Eye Care, Driebergen, the Netherlands (JWV, IJEV, RL-G). Dr. Abulafia is a consultant for Hoya and a speaker for Haag-Streit and Zeiss. Dr. van der Meulen has received grants from Alcon. Dr. Lapid-Gortzak is a consultant for Alcon, Eye Yon, Eye Med, Hanita Lenses, Sanoculis, and Santen, and a speaker for Alcon, Hanita Lenses, Thea Pharma, and VSY Biotechnology. The remaining authors have no financial or proprietary interest in the materials presented herein.